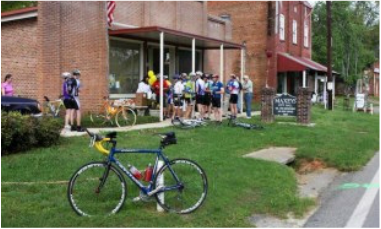 Support for the trail comes from SPLOST, the Georgia Department of Transportation, and the Athens-Clarke County Department of Leisure Services, as well as the many donors and riders within the community. (Scroll down to learn more about the communities). 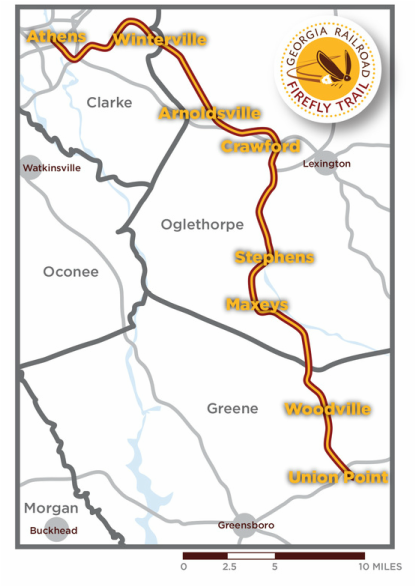 At its northern/western end, the Firefly Trail begins on East Broad Street close to the University of Georgia, the Classic Center, the North Oconee River Greenway, and downtown Athens’ many restaurants, shops, and music venues. The E Broad St. trailhead is across the road from the Multimodal Transportation Center (Athens Transit). Climbing back up to the historic rail bed, trail users continue roughly parallel to Oak Street and will, once construction continues, pass close to the new Oconee Street Park and Ride lot before swinging east and passing under Loop 10 and Winterville Road. The first segment will end on Winterville Road near Spring Valley Road. 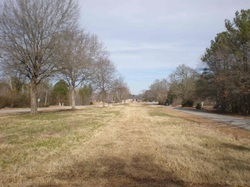 Beyond this segment, plans are for the trail to continue on or near the historic rail bed as it curves into Winterville. The trail will pass near Winterville’s Five Points with its offices, restaurants and convenience store, and then parallel Main Street past the Winterville Depot and out to Oglethorpe County. Here, the rail bed stays close to Arnoldsville Road, passing by homes, farms, churches and the historic town center of Arnoldsville, including the ruins of the Arnold Building. As the rail bed approaches U.S. 78, it curves east toward Smokey Road and thence into downtown Crawford, passing right beside the Crawford Depot, currently undergoing restoration. The downtown area offers several places to eat and shop, as well as stores close to the trail where riders and walkers can re-supply. Note: In many places, trail design will require flexibility and adaptation to meet the needs of the community. In Crawford, for example, the Firefly Trail will need to leave the rail bed to go around the Johnson Ford building, which is currently vacant. Because of the history of the corridor since abandonment in 1984, this is one of several places where the trail may have to share space on existing streets or be constructed within an existing road’s right-of-way. The Board of the Firefly Trail is very sensitive to the needs of property owners along the corridor. Our goal is to create a trail that enhances property values and protects property rights while providing a quality trail experience for riders, walkers and runners. From Crawford, the rail bed follows the ridgeline east of Hutchins Road before crossing and then paralleling Ga. 77. From this point, the rail bed is seldom far from the newer highway, alternately burrowing through wide cuts or riding an elevated berm to maintain its level grade. In warmer months especially, trail users will appreciate the well-shaded historic corridor compared to the more open road a few yards away. This segment will take users through pastures and forests, past working farms and historic homes and churches. The Board’s vision is to develop all or part of rural portions of the trail not only with a paved surface suitable for all types of bicycles, but with unpaved side paths for equestrians and mountain biking. In Maxeys, the original depot still stands near the rail bed. The city, which owns much of the approximately 3 miles of corridor within the city limits, is actively working to secure additional right of way and construct the trail with awarded Recreational Trails Program dollars. Trail users could enjoy a cool break in front of City Hall or check out the antique store next door. Managed pine forests dominate the landscape between Maxeys and Woodville. In Woodville, one option for the trail is to widen and upgrade an existing off-road sidewalk that currently lies between Ga. 77 and the rail bed. A barbecue restaurant and convenience store provide amenities within a few yards of the trail’s proposed route. South of Woodville, the rail bed continues mostly through working tree farms and other woodlands, never far from Ga. 77 but leveling out the ups and downs of the highway. About a mile from its southern terminus, the trail crosses the wide, sloping lawn of Union Point Elementary School. The railroad’s third and final elevated crossing, over North Rhodes Street, occurs shortly thereafter. In this area, the trail holds the promise of providing a safe route for children to walk or ride to school. In Union Point, trail users will find an historic downtown business district, museum, theater (currently undergoing renovation) and convenience stores for supplies. Nearby, mountain bikers will enjoy more than 26 miles of privately developed mountain bike trails at Hart Farms-Corry House Trails. With plenty of parking and easy access to I-20, Union Point will be a great starting and ending point for adventurers from Atlanta, Augusta, Macon, Milledgeville and points beyond. With enthusiastic support from the downtown development authority and city leaders, the city is actively working to make the trail a reality, thanks also to awarded Recreational Trails Program funds. Want to help? Volunteer here.